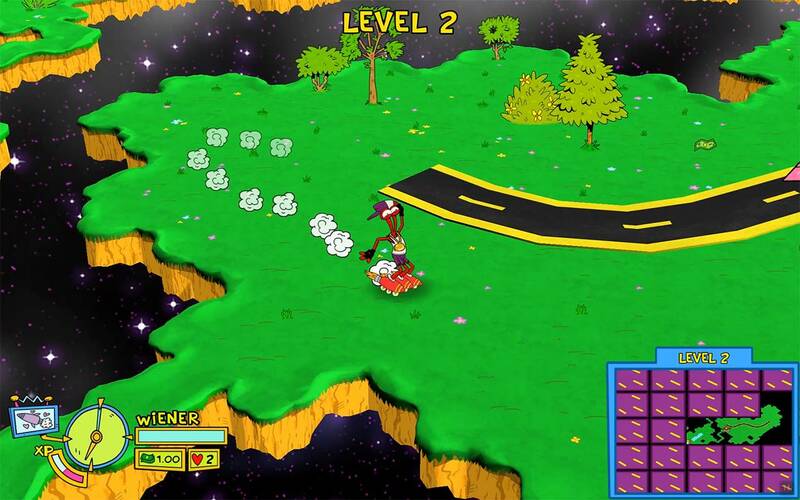 HumaNature Studios has announced when ToeJam and Earl: Back in the Groove! will release on Nintendo Switch, the fourth entry in the beloved, funkadelic action roguelike series. Hoping to impress Latisha and Lewanda, ToeJam and Earl have “borrowed” the Rapmaster Rocket. However, after a black hole-related accident, they are back on the floating remnants of Earth, scrambling to pick up the pieces of their ship before anyone can notice that it’s missing. You will sneak around Earthlings in procedurally-generated levels, where presents are hidden that will activate random effects to help the alien duo recover the ship parts. Whether that be Rocket skates, Icarus Wings, Boomboxes or other presents, unlockable hats will also lend you hidden powers that persist across playthroughs. There’s also the chance to team up with a friend in local multiplayer, choosing from nine characters to play as. While minigames like the side-scrolling HyperFunk Zone from Panic on Funkotron or a rhythm-based dance-off will reward you with extra presents and cash. “ToeJam and Earl: Back in the Groove! is what I’ve been wanting to do for the series for over 20 years,” explains HumaNature Studios founder Greg Johnson. ToeJam and Earl: Back in the Groove! will release on the Nintendo eShop for Nintendo Switch worldwide on 1st March 2019, priced at $19.99.